We are getting a lot of visa questions here and the high number of already existing questions and answers makes it hard to keep track at times. My feeling after being on the site for a while is that user @GayotFow does an excellent job at keeping the UK-visa questions sorted, due to extraordinary commitment for this site. For Schengen visa question there are similarly highly-engaged users on here (and thanks, applause and +1s for them from me) but I do recently get the feeling that we are not answering Schengen visa questions as efficiently as we could. I see a lot of questions that get answered even though very likely there is a duplicate for them already out there somewhere. On the other hand some questions get closed as duplicates even though they do not really answer the closed question. I have tried pointing out so in comments and chat recently but I am no expert myself and often get lost or don't have the time. Therefore, should we create a community wiki answer to this question that lists the most frequently asked Schengen questions and the canonical answers to them so that we can easily and quickly close new questions as duplicates.? Below I will post a meager start and invite everyone to contribute to this post. Related discussions on closing as duplicates are plenty on here and I invite everyone to be careful when closing as dupes. There had been a request for a blog post as far back as 2013 that never took off, to my knowledge. This post here (also from 2013) is much related and could be a good starting point for further CW entries. Edit: It has been suggested in chat to justify the premise for this suggestion quantitatively. 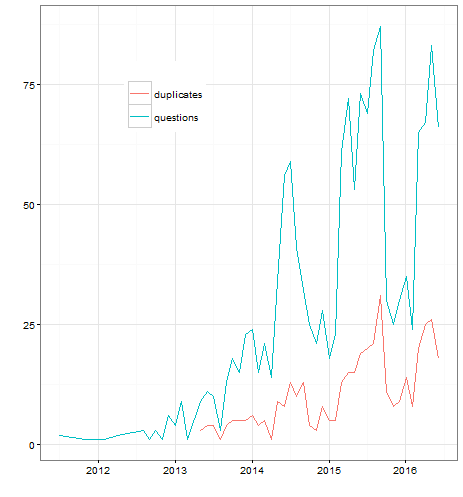 Below is a plot that shows the number of Questions tagged schengen since the beginning of time and the number of such questions closed as duplicates. You might marvel at the seasonal effect but the message here is that we get up to 75 Schengen questions a month (possibly more since bad questions might never get tagged correctly) and close on average 30% of those as duplicates. Searching for a good dupe can be cumbersome among the 1,444 questions tagged schengen as of right now and therefore the suggested community wiki answer. Not the answer you're looking for? Browse other questions tagged discussion duplicates canonical-questions statistics community-wiki . Can someone please write a blog post about Schengen visas? Should we add visa expiration meaning to the wiki summary?